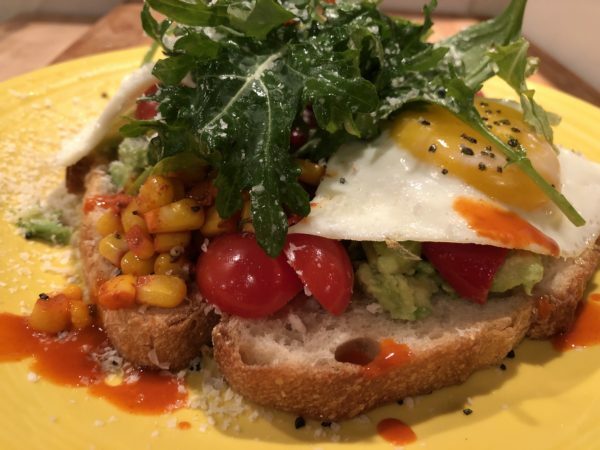 Think, Mexican Street Corn meets Avocado Toast. The “directions” are more like assembly suggestions; do what feels right. This is avocado toast, not Beef Bourguignon. Toast bread lightly. Slice avocado, tomato, and red pepper. Toss corn with chili powder, half of the lime's juice, salt and pepper. Toss arugula lightly with salt and remaining lime. Fry eggs to your preferred doneness. Assemble toast, topping with cheese and hot sauce. * You can get fancy with Cotija, but honestly a little Parmesan would work great.